Cesarean surgeries are relatively heavy operations that doctors carry out to reduce life threatening risks if any abnormal conditions occur for a mother and her baby during birth. Any intervention to natural delivery, including via Cesarean section which usually should be limited to the few and limited cases, are considered as acts of violence against women and their babies by some organizations and experts. In general, 90% of labors are natural and 10% are carried out as cesareans. The World Health Organization (WHO) announced in 1985 that countries which have lower rates of deaths during childbirths, also carry out less than 10% Cesarean operations. However, research shows that the rate of Cesarean sections in Iran is very high and infant mortality in Iran is equivalent to 6 per 1000 births, which means 9 to 10 times that of developed countries. Iran ranks first in counts of Cesarean sections throughout the world. While the World Health Organization considers the standard number of Cesarean deliveries between 10 to 15% of all births, the Iranian regime’s state media have published a painful reality. Reza Paydar, deputy head of Medical Sciences, announced that natural births in Iran have dropped 50 to 60 percent. 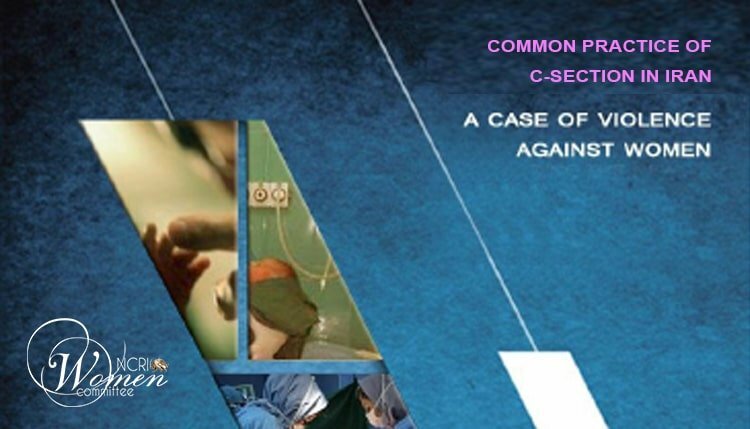 These statements, however limited and partial, show only the tip of the iceberg, emphasizing that the Cesarean section has become a common practice in Iran. Why are C-sections so common in Iran? Under the Iranian regime’s rule, where the lives and health of people, particularly women, are not important in policy making, the method of birth is also another occasion for violating women’s rights and at the same time profiteering by regime officials. There are a variety of reasons to the high numbers of C-sections in Iran, however, the root cause to all are found in the corrupt nature of the state affiliated bodies who subsist by plundering people. Some specialists affiliated to the Iranian regime related the prevalence of C-sections to mothers’ fear of pain during birth, which in itself is a tacit admission of the regime’s lack of resources, policy failures and incorrect methods of natural deliveries in Iran. A mothers’ calm has a lot to do with the amount of calm passed on to her by midwives and medical staff. Unfortunately, midwives –like many other social sectors in Iran– do not have enough calm and capacity to handle and behave correctly, in this case with mothers as a result of themselves being deprived of their basic rights and mass employment problems. They receive only 10 to 15 percent of the tariffs from maternity insurance for every 2 or 3 deliveries and 7 or 8 pregnant women they must care for at once. “The cost of natural labor for non-insured women in public hospitals starts from 25 thousand toumans whereas a Cesarean section delivery costs some 90 to 120 thousand toumans. In some private hospitals in Tehran, the cost for a Cesarean section delivery can reach over 1 million toumans which includes hospital fees and fees for the surgeon and his assistant.